Hi girlies! Today I am sharing some little tips you can implement to live a healthier lifestyle. When I do all the things below, I not only feel amazing physically but mentally as well. Now I’m no doctor or trained in this stuff in any shape or form, I’m just sharing what works for me. These tips help me to achieve the best version of myself and I feel so happy and healthy when I follow through with these routines. I don’t know what it is about routines, but they help me feel so balanced and set me up to have a great day every day! I worked really hard on this post to go really in depth on each tip, I really hope you enjoy these tips and can try some out! A little disclaimer though, these tips are just what works for me, I’m not saying that my tips are the only way things can be done. I’m simply offering insight into what makes me feel my best, inside and out! This journal is such a vital part of my day, it’s the first thing I do when I wake up and the last thing I do before I go to bed. It’s ” The simplest, most effective thing you can do every day to be happier.” I have really tried to stop looking at my phone when I wake up, I used to turn my alarm off then instantly go to Instagram and scroll and scroll. I wasn’t realizing that it probably wasn’t the best way to start off my day. Using the Five Minute Journal, everyone morning I write 3 things I am grateful for, 3 things that would make today great, and 2 daily affirmations. After my day, I come back to the journal and write 3 amazing things that happened that day, and 2 things that could have made the day even better. It sets me up to have a great day and think positively, I’m not kidding, you will see a change in your life if you do this kind of journaling. I am going to insert some quotes from the book because it can explain how and why it works way better than me. “In about five minutes per day, you can establish a positive pattern of thinking and acting when it really matters. It’s the ideal time window that allows for minimal effort and a wild reward.” “When you write the journal every morning, you push past resistance. You give yourself the opportunity to grow. You make the commitment to keep going, to make your mark on the world.” Hopefully, that shed some light on what the journal is all about. It has truly transformed my thinking and way the way I go about my day. In my opinion, focusing on the good drives out all bad. I highly recommend checking this journal out! You can buy your own by clicking on the pic above! Lemon water in the morning is one of my major tips!!! If you are going to take away anything from this post, I hope it is this because it makes a huge difference in your body. Every single morning, I will drink a glass of water will freshly squeezed lemon juice in it. I do this because it kick starts your metabolism, flushes the digestive system and hydrates your body. I see a difference in my body when I do this and I bet you will too. It is such an easy thing to do that makes the world of difference. Lemons has sooooo many amazing benefits for your body and you need to take advantage of them. After I drink my lemon water, then I drink my coffee with one scoop of Vital Proteins collagen peptides. This little routine sets my body up for the day. You need to try this out! I have become totally obsessed with dry brushing!!!! After I saw Lauren Elizabeth talking about it and using it, I knew I had to give it a try. Whatever she’s doing is working because she looks amazing!!!! So basically, what you do is brush your body from your feet all the way up in large strokes in the direction of your heart. I do this before I get in the shower and it makes you feel amazing. It hurts the first few times you do it because your body is getting used to the bristles. But it gets addicting, your body tingles and it feels so good and refreshing. 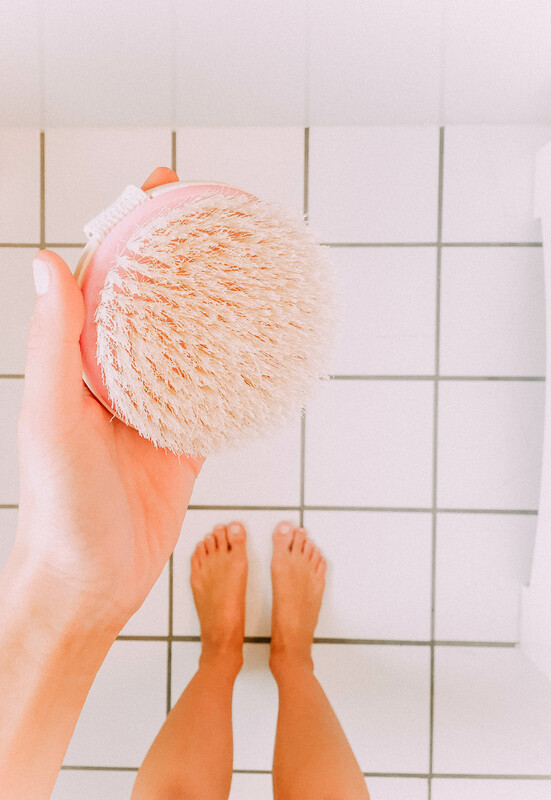 By dry brushing, you are stimulating the lymphatic system, which has so many benefits in itself. By brushing towards your heart, you are detoxifying your body in a natural way, all the bad stuff is flushed out and you are left feeling great. 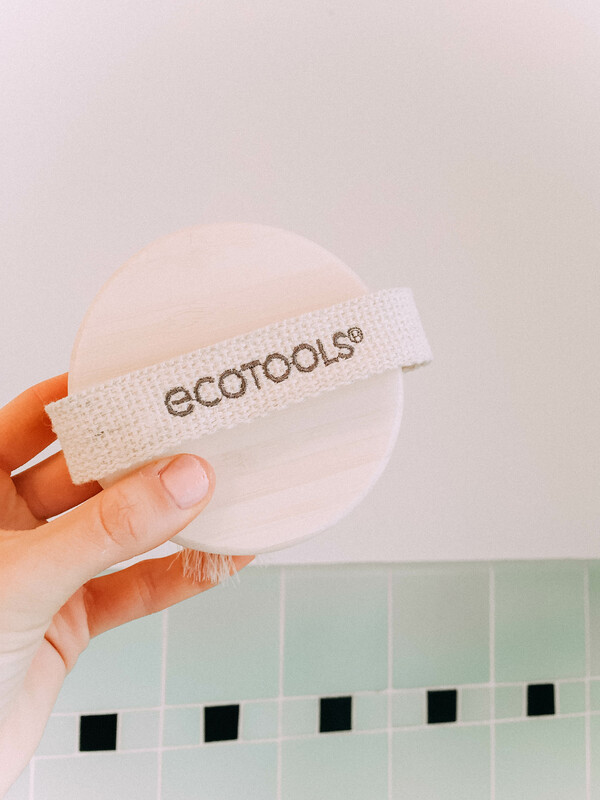 Detoxification is the main reason why I dry brush, but some other befits include: new cell renewal, exfoliation, cellulite reduction, and blood circulation. I can’t be the only one totally addicted to kombucha. I love this stuff because of the way it makes me feel and the good that it is doing for my health. I have been drinking kombucha regularly for about a year now and the benefits are unreal. This pricy bacteria, to say it literally is so good for your body if you are drinking it at the right time! The benefits are truly amazing, they include aid in digestion, detoxification, energy, weight loss, cholesterol reduction, and even cancer prevention!! There are so many other benefits too, it is insane! I drink kombucha to aid in my digestion. It makes my tummy feel amazing and it keeps that area bloat free! But you need to make sure you are drinking kombucha at the right time to take in all the amazing benefits. If you are looking for aid in digestion, you are to drink it before your meals, this is what I do! If you are looking for weight loss, drink it as a snack because the acidity curbs your appetite. You are really not supposed to drink it with meals, I’ve learned because it will curb your appetite and you will get fuller faster and not take in the nutrients from your food. This is what I’ve learned over the past year from research and different articles. 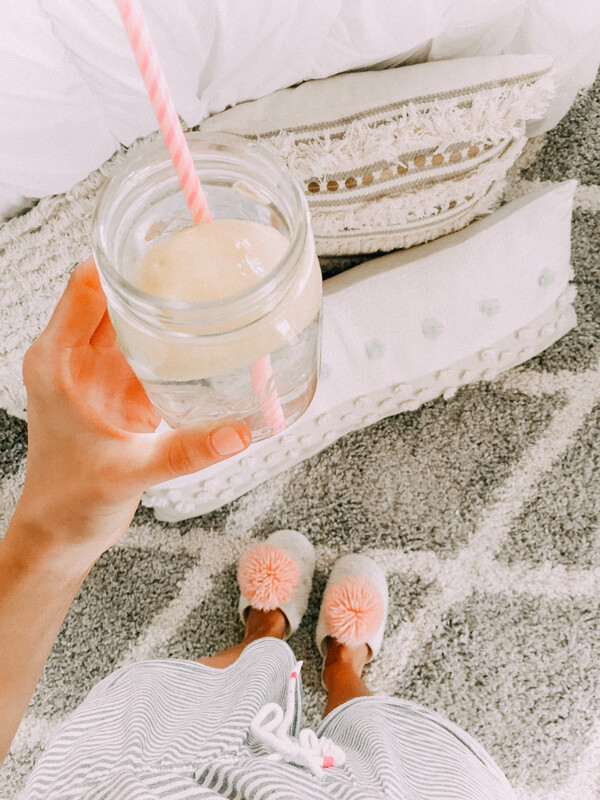 There are so many articles about the benefits of kombucha and when to drink it, so feel free to research it some more! I just wanted to pop this one in here but I’m pretty sure you all know the amazing benefits of water. I try to drink as much water as I can each day. This is the water bottle I have been loving, it comes in three colors! 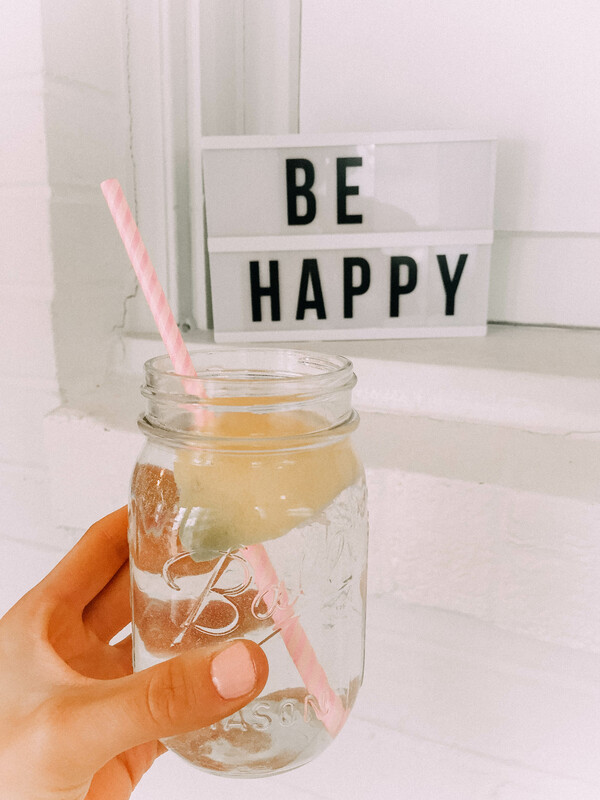 But drinking a ton of water helps your skin, flushes out the toxins in your body, boosts your immune system, headache prevention, I mean the list goes on and on. My tip is to get a cute water bottle and drink a ton of water. You will feel great, I promise!! I love bedtime because it is the time where I can reflect on my day and unwind. At about 9:30, I start my bedtime routine. I like to go to bed early and wake up early, it is just what works for me and makes me feel productive. I first start by doing my skincare routine and then fill up my water bottle. I then get into my bed, turn on my essential oil diffuser and start to unwind. I call this my “me time” where I don’t work on school but stuff that makes me happy. I will work on a blog post, watch a youtube video, or read some of whatever book I am reading. I really love reading before bed because it is so relaxing. After that, I will set my alarm and write in my five minute journal. I really love this routine and it’s so important to get into a routine. You need to make time for yourself and this is a perfect way to do that! Find what works for you and stick to it! I’m definitely not the queen of the gym and don’t know how to use all the fancy equipment, but I really do love working out! As Elle Woods once said, ” Exercise gives you endorphins, endorphins make you happy.” Now, who doesn’t want to be happy???? I can honestly say, on the days I workout I am happier, more productive and I feel great. Sometimes it can be very challenging to stay motivated to go to the gym or go for a run, I just try to go and get it over with. I think of how great I am going to feel and the good that it will do for my body. I workout to live and maintain a healthy lifestyle, not really to look a certain way. I am truly confident in my body and the way I look, I have noticed over the years that if you are working out to look a certain way, it is so much harder. You feel like you are never doing enough and that your work and dedication is never paying off. Once I took the mindset of working out to feel good and to live a healthier lifestyle, it all changed for me. I became confident in my body because my body rewarded me for it. I look and feel the best I ever had and it didn’t feel like that much work at all. From then on I wanted to treat my body will respect and fuel it will everything it needs. Working out shouldn’t be a chore but something that enhances your life and your day. I would say I workout on average 4 times per week or less, whatever my body feels like doing. This just works for me, I feel good inside and out. For me, I don’t want to workout every single day or do super intense workouts. I really try to listen to my body and see what it needs. If I’m feeling tight, I will walk on the treadmill and then stretch and train my arms. If I have a lot of energy and I’m feeling like I’m ready to go then I will do some HIIT cardio (high-intensity interval training). I really love doing this because I blast my music and sprint on the treadmill, it’s honestly fun! I will train my abs every time I workout out too! Sticking to this routine and eating healthy makes me feel so confident in my body and I hope everyone can achieve that. You are beautiful inside and out and you need to believe it sista! This is just my go-to breakfast because it is so yummy and filling. Raspberries are my favorite fruit and I have to have them on hand at all times. Now I’m gonna share my a few junk food favorites because, in my opinion, it’s important to treat yo self and not restrict yourself from the goodies you love. When I’m in the mood for something salty I love eating salt and vinegar kettle chips. When I want something sweet I go for Reese’s peanut butter cups! If you made it this far, I love you!! Thanks so much for reading! I really hope this post was helpful and you learned a thing or two! This week was a short because of Easter break and it was a great one! I got accepted to RewardStyle after applying a few times and I am beyond thankful. Being on this platform is so honorable because of how exclusive it is and I am so thankful that I am now a part of it! Have a great weekend! !